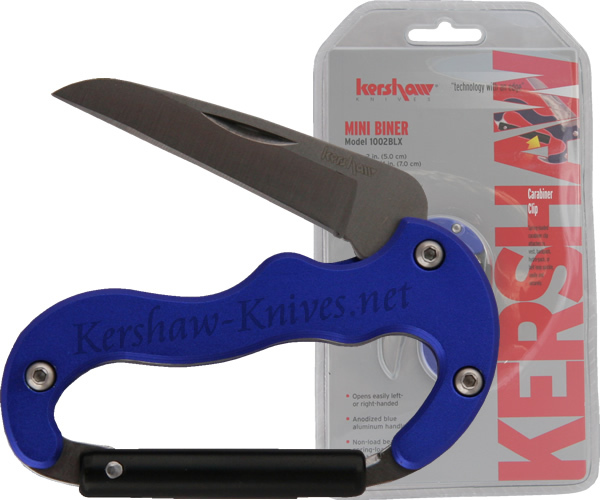 The Blue Mini Biner tool from Kershaw is the small version of the full size Carabiner tool. The body of this Kershaw 1002BLX carbiner model is aluminum that is coated with blue teflon. The latch on the carabiner is non-load bearing and clips to just about anything. The blade is very sharp and made of 420J2 stainless steel. While the blade is open the body of the carabiner does a great job serving as a knife handle.